Donald Anthony has slashed the price on his four-bedroom, two-bathroom house by almost $80,000. He also added $40,000 worth of improvements, including a new kitchen and landscaping in the leafy yard. He's used three different agents. He's listed the 1,800-square-foot home, an immaculate ranch on a quiet cul-de-sac, on for-sale-by-owner sites, in newspapers, on cable television and community site Craigslist. He or his agents have spent at least 50 idle afternoons hosting open-house events. But the 74-year-old retired physicist cannot unload the house, now listed at $489,950, well below the price of comparable homes in the fast-growing region between San Francisco and Sacramento. "The buyers have vanished," Anthony shrugged in front of new Shaker maple cabinets and never-used appliances. "If this doesn't sell post haste, I'm going to bite the bullet and pull it off the market." If Anthony can't wait another year or more, he might as well rip out the for-sale sign now. Although few experts predict that home values will fall dramatically in 2007, many economists say that prices won't improve for 12 to 18 months. And without the cushion of rising home equity, which softened the blow of high oil prices last year and kept consumers buying big-ticket items at a rapid clip, Americans may lose confidence in their finances — and the broader economy is likely to suffer. "We are currently experiencing the worst of the market freeze, which is being exacerbated by the gap between the buyer's desire for bargains and the seller's fantasy of what they once thought their homes would be worth," said Diane Swonk, chief economist for Chicago-based Mesirow Financial, who forecasts a rebound in early 2008. "The good news is that there are some signs of stabilization. The bad news is that a substantial backlog of unsold homes still exists." Global forces and U.S. monetary policies play important roles in the housing slowdown, which already appears to be depressing the national economy. The newest forecast by Moody's Economy.com, a private research firm, projected that the median sales price for an existing home will decline in 2007 by 3.6 percent — the first decline for an entire year in U.S. home prices since the Great Depression of the 1930s. The Commerce Department reported Nov. 29 that gross domestic product grew at a 2.2 percent annual rate in the third quarter, down from 2.6 percent in the second quarter. The residential construction falloff subtracted 1.2 percent from growth, the department stated. Peter Morici, a business professor at the University of Maryland, said artificially low interest rates over the past half-decade encouraged China and other exporting nations to purchase 10-year bonds, which kept U.S. mortgage rates low and fueled the housing bubble — despite a gaping trade deficit that should have sapped investor confidence years ago. "In order to play this Ponzi scheme, the value of the homes had to go up faster than the economy grew and faster than people could service their debt. We've reached that limit," Morci said. "The housing market sustained the economy at a time of very large trade deficits. It's been a false prosperity." In addition to macroeconomic forces, regional U.S. housing markets faced particular challenges. In expensive coastal cities, economists say, price appreciation hit a wall. San Francisco and Boston, where many investors enjoyed double-digit property gains in the late 1990s and the first half of this decade, have simply become unaffordable. The number of Californians who could comfortably pay the mortgage on an entry-level home fell to 24 percent in the third quarter, down from 44 percent in 2003, according to the California Association of Realtors. The median price statewide was $563,190. "I don't see how the economy can continue with these prices," said Stephen Levy, senior economist of the Center for Continuing Study of the California Economy. Housing prices in New England grew an average of 10 percent per year from 2000 to 2005, compared with 8.3 percent for the nation as a whole. But a forecast released Nov. 14 by the New England Economic Partnership, a nonprofit forecast organization with members are from private industry, government and academia, projects prices in New England will be flat through 2010, below the U.S. forecast of 2.1 percent growth per year. 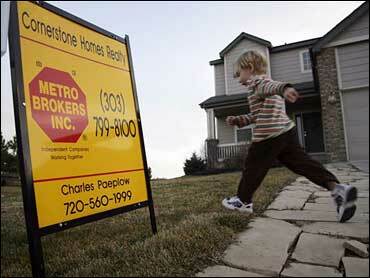 Housing prices in Massachusetts are expected to decline 9 percent through 2010. "Areas along the coast of the nation and the large urban areas tend to see stronger price gains in housing upturns, and stronger declines in downturns," said Celia Chen, a housing economist with Moody's Economy.com in West Chester, Pa. In Sun Belt havens such as San Diego, Las Vegas and Phoenix, overzealous construction resulted in a glut of new homes and condos. Real estate experts say sellers and developers there will struggle throughout 2007. "We have to work off the inventory," said Daniel Nussbaum, a licensed investment adviser and CEO of Calabasas-based TheUSARealty.com. "I honestly think we're past the worst of it, but if you don't take out your magnifying glass you might not notice." Florida will likely remain the toughest market for buyers and sellers. Building frenzies in Miami, Orlando and the Caribbean coast resulted in a plethora of for-sale signs. Developers desperate to unload inventory offer free granite countertops, appliances and furniture, even cars, vacations and mortgage payments for up to six months. Meanwhile, insurance companies dramatically raised premiums after Hurricane Katrina. Depending on where they live and their policies, Florida home owners may pay as much as 10 times more for flood and wind insurance than last year; premiums on mansions can exceed $30,000 per year. That's caused monthly costs to skyrocket, pinching current owners and making it all but impossible for renters to buy. Throughout Florida, 12,773 existing single-family homes were sold in October, down 22 percent from a year ago, according to the Florida Association of Realtors. Florida's median price was unchanged at $242,500, but more than half of the urban areas posted declines. Around Fort Myers, the median price plunged 44 percent to $249,200 from October 2005. But not everyone is pessimistic, even in beleaguered Florida. "People start thinking about buying a retirement home in their late 50s, and baby boomers are approaching that age," Denslow said. "The demand for residential housing here is only going to get stronger through 2020." Meanwhile, back in Antioch, where Don Anthony is struggling, Zach and Katherine Chouteau are looking for a house or condo with a home office and room for twin pug dogs. They'd love to buy in Antioch, but the couple, who moved from suburban New York five years ago to start their own business, is reluctant to commit. Like many shoppers, they're discouraged by higher interest rates and rampant appreciation in recent years and the perception that many San Francisco Bay Area owners have halcyon-day notions of multiple offers and bidding wars. "It's definitely a friendlier market than earlier this year, but not a dramatically cheaper one," said Zach Chouteau, 41. "People have gotten really spoiled by the rapidly escalating prices, and it seems like they're in denial that things have leveled out. They're just fishing for the best price."